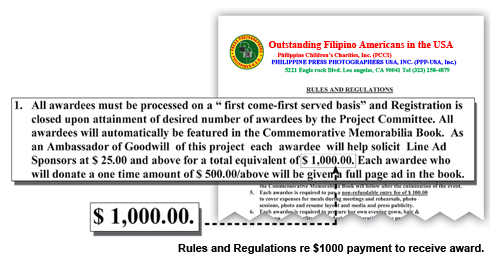 LOS ANGELES – PinoyWatchDog.com has began a series of investigative reports detailing what it calls the ‘pay to play’ culture of Filipino American community awards events, and how it impacts on the ethics and perception of Filipinos. Darna B. Umayam, a reputed multi-awarded community leader in Southern California, has been running an active business for years, producing and promoting these events. She told PinoyWatchDog.com that she feels harassed by persistent e-mail inquiries sent to her by our reporters regarding her phantom criteria for selection of the recipients of her 100 Outstanding Filipino Americans of USA (OFA-USA) awards project. The presentation of awards is scheduled for July 28, 2012 at the Universal Hilton. OFA-USA is a joint project of Philippine Press Photographers USA, Inc. (PPP-USA, Inc.) — headed by Jimmy Hernandez, Sid Guerrero and Bobby Saddul, chairman, president and vice-president, respectively – and Ms. Umayam’s Philippine Children’s Charities, Inc. (PCCI). Ms. Umayam is project director of OFA-USA, and uses a postal address of 5221 Eagle Rock Blvd. Los Angeles, CA 90041, her residence. 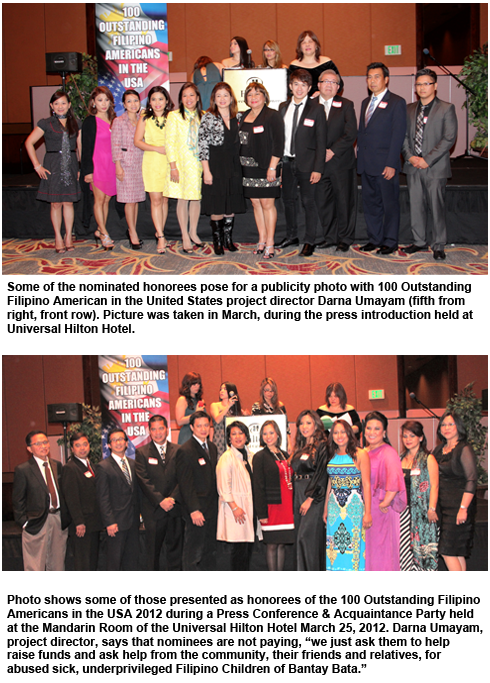 The organization had a presentation of about 85 honorees on March 25, 2012 at the Universal Hilton Hotel. Final presentation of awards will be during a Black Tie Awards Night on July 28, 2012, reportedly at the same Sierra Ballroom of the Universal Hilton Hotel. Since that time numerous concerns have been raised regarding this awards event to and within the editorial board of PinoyWatchDog.com. It was then followed by a cascading series of events triggered by Ms. Umayam’s cordial protest to Joel Bander at the Philippine Consulate on June 12, 2012, about a comment tangentially related to this event, discussed in the companion article on page 14. Please also read a related story at this link: http://www.pinoywatchdog.com/2012/06/07/adrian-lecaros-46th-assembly-district-race/. 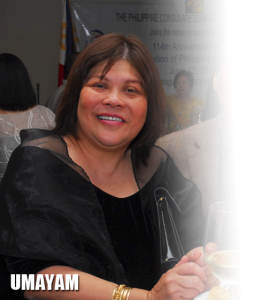 And if this report seems peppered with e-mail quotes of Ms. Umayam, it is because of PinoyWatchDog.com’s policy of providing its readers complete facts and investigation, with all parties having an opportunity to air their side. However, by June 21, 2012, Ms. Umayam, when contacted by Mr. Grava of PWD, said that, “it seems like a harassment already” as he followed up Mr. Bander’s e-mail questions that Umayam was refusing to answer, along with conflicting claims and facts. PinoyWatchDog.com’s investigation had obtained the ‘Rules and Regulations’ of this event from a proposed honoree who felt offended by its terms. It states: “As an Ambassador of Goodwill of this project each awardee will help solicit Line Ad Sponsors at $ 25.00 and above for a total equivalent of $ 1,000.00. Each awardee who will donate a onetime amount of $ 500.00/ above will be given a full page ad in the book. However, PinoyWatchDog.com has obtained this Hold Harmless Agreement, and it only concerns the use of honorees’images, nothing about the release of their names. Ms. Umayam had promised both writers of this article a list of honorees. PinoyWatchDog.com finds this evolving secrecy about the intended honorees to be quite odd, as 85 of them were displayed in three picture taking sessions on March 25, 2012 at the Universal Hilton. 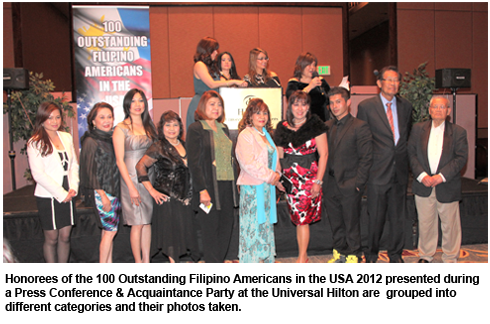 PinoyWatchDog.com discovered that 85 of the 100 awardees were from the Los Angeles area. Moreover, an examination of the list of honorees presented seems heavily weighted towards Umayam’s closest friends and business associates. PWD noted that the list did not include a statistically balanced number of honorees from her own Kalayaan Organizing Committee and the other Kalayaan Organizing Committee, some of whose officers her partner and friend Trini Follente had sued for defamation last year. Umayam wrote PWD on June 13, 2012, that “there were 285 recommendations to this project however, we chose 100 best of the best.” Another e-mail from Umayam stated: “NOT 85 of the honorees came from Los Angeles. Out of the 100 honorees ONLY 22 came from Los Angeles. “Honorees were picked from all over Southern and Northern California and out of state per recommendations from other good people. It’s not true that I only get honorees who are my friends. …. Out of the 100 honorees only (8) of my real close friends were selected because they really deserved to be one. They have served the community for more than 10 years,” Umayam said. As of press time, PWD has not received names of out-of-state honorees from Chicago, New York and other states, like Arizona, New Mexico, New Jersey and other cities and states where there are large concentrations of Fil-Ams. 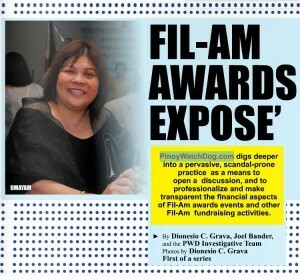 A review of the photographs and emails about the event reveals, in PinoyWatchDog.com’s view, seven photographers are among the honorees. An eyeball examination of the photographs of the March event with 85 awardees also reveals that almost everyone is from the Los Angeles area. Diony Grava: Who are the 38 members of PICCSC you said were selected as awardees? Darna Umayam: Not 38 members of PICCSC were awarded. It was about 10 only. One honoree in the entertainment industry told PWD he/she thought it odd that of an entire country of Filipinos that even more than one photographer would be so awarded as 100 Outstanding Filipino Americans in the US. Indeed, such noteworthy Filipinos as California Supreme Court Chief Justice Tani Gorre Cantil-Sakauye, L.A. Superior Court Judge Mel Recana, American Idol Runner-up and singing sensation Jessica Sanchez, stalwart entrepreneur Loida Nicolas-Lewis, or either of the Oriels, publishers of the Asian Journal, were not included. An attorney honoree, who asked not to be named, stated he/she was called and asked to be an honoree, but no mention of $1000 was made. However, he/she was asked for contribution, and said would probably buy an ad for the program. “They need a few awardees that are not in the inner circle to make it appear legitimate,” one observer told PWD. That attorney honoree said he/she was never sent any contracts or hold harmless agreements. Neither of these honorees was required to submit any write-ups, resumes, etc. They were just called and asked. Umayam did provide the charities such as Employer Identification Number (EIN) so her contentions could be confirmed with Exempt Organizations Select Check on the IRS homepage, too close to deadline but most certainly demonstrating good faith. A search of the California Secretary of State’s business search homepage revealed that Philippine Children’s Charities is an active corporation with Umayam as agent for service of process. 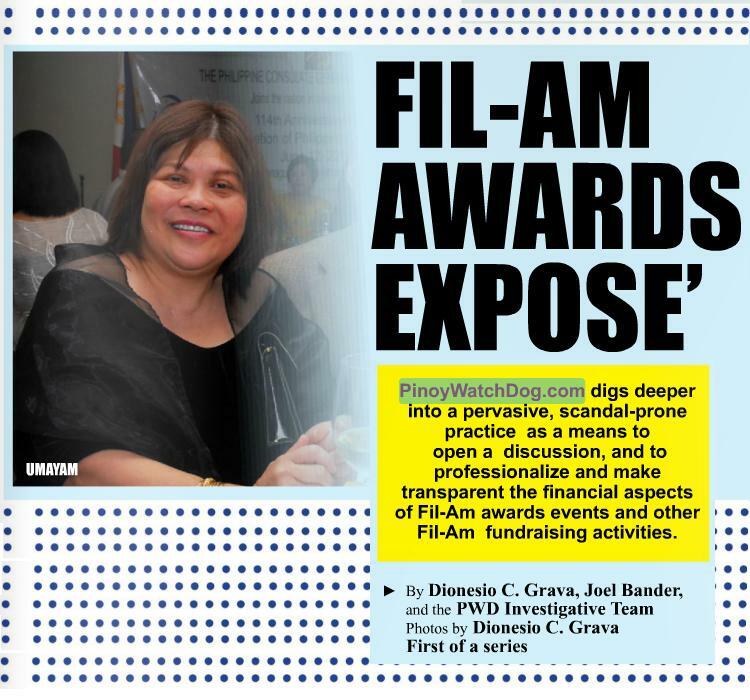 PinoyWatchDog.com has also sent numerous e-mails and made calls to ABS-CBN Foundation and Bantay Bata163 Executive Director Tina Monzon-Palma, inquiring whether it is true that she highly endorsed the OFA-USA award project. She has refused comment. June 14, 2012 Bander e-mail to Umayam: “I would also be interested in the accounting that is public as it deals with this project, and how much actually ends up with the beneficiaries. Please let me know how to obtain it.